This E3 saw the AAA sphere continue its drift toward a new hybrid model of online experience, drawing its design inspirations from Bungie’s Destiny as much as from traditional singleplayer modes and team deathmatches. There’s not a great name for this type of game yet (we’re still very much in the “-like” era of a genre title) but it’s clear that the “Destiny-like” game design is already making its mark. From Bioware’s Anthem to Bethesda’s Fallout 76, this type of small-party, multiplayer-focused first person game is clearly the current AAA darling child. I’ve written before about how I think that Bioware’s Anthem isn’t playing to the development studio’s historical strengths, and while initial thoughts on the game from the show floor have been mostly positive, even the most glowing recommendations agree that the game appears to be lacking in Bioware’s traditional story-and-character-first approach to worldbuilding. What appears to be the next game to succumb to this ur-genre is a surprising one: Bethesda’s Fallout 76. 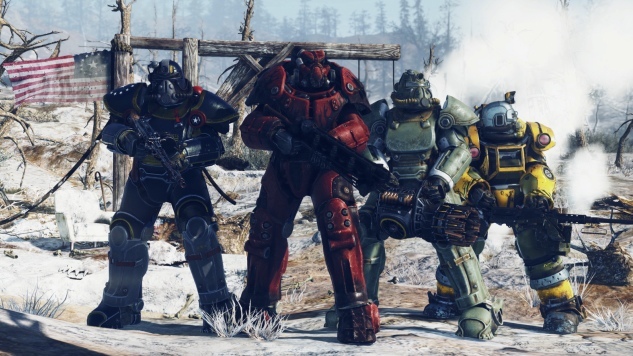 While Fallout 4 dabbled in a construction element, Fallout 76 plans to make crafting and survival its primary focus, and looks to be based around a multiplayer element. Given that the series’ lore often deals with the consequences of Vaults outgrowing their initial space to expand into the Wasteland above, it’s not unlikely we’ll be seeing a similar, small-multiplayer Destiny-like experience based around the expansion of the player’s vault into the Wasteland. Early reports suggest it also might take some inspiration from battle royale games, another thematic tone that would dovetail with the series’ post-apocalyptic setting. I could be wrong—we won’t know exactly until the game’s out—but even if Fallout 76 does turn out to be a more traditional Bethesda-style Fallout title with only a few multiplayer elements, it feels like a notable change in the traditional design styles of the studio. Perhaps this is, as some have reported, a spin-off title rather than a mainline Fallout game, but even so it’s a first for the Fallout series to focus on multiplayer to this extent. Ultimately this type of game—focused on small-group, instanced-and-open playspaces, and MMO-inspired raids and loot drops—looks to be the upcoming dominant force in multiplayer shooters, and I’m not sure this is a good thing. It’s a type of game that feels tailor-made for lootboxes or similar methods of semi-random drops. Early gameplay demo videos of Anthem showed off the loot drop systems, though those elements are notably less present in more recent videos from E3 2018. This suggests a trend that many singleplayer games have drifted toward for some time: combining elements of roleplaying games, MMOs, and traditional shooters allows for a more cohesive “mega-genre,” similar to those we’ve seen with games like Assassin’s Creed (which, notably this year, is adding the conversation-wheel mechanics made famous by earlier Bioware titles). Time will tell if this design sticks, but right now it looks like it might be the future of some of your favorite singleplayer games—for better or for worse.